The Thruxton is born of the café racer culture that dominated motorcycling in the 1960s. 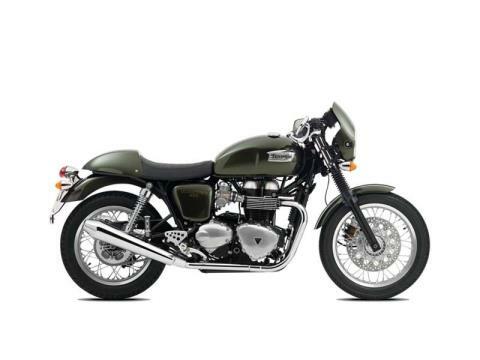 Back then, British twins, usually Bonneville engines, were used to form the basis of home built bikes. Used to race from one café to another, they featured extensive modifications such as dropped bars, single seats and upswept exhausts. 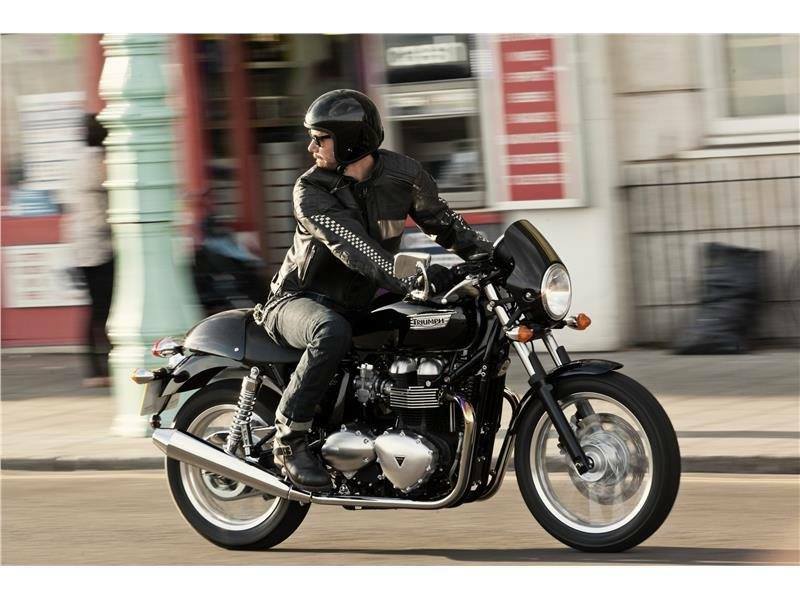 To this day, we’ve kept many of these styling cues for the modern Thruxton. Named after the high speed British circuit where Triumph enjoyed great success in production racing, it follows in the tire tracks of the legendary 1960's Thruxton T120R. 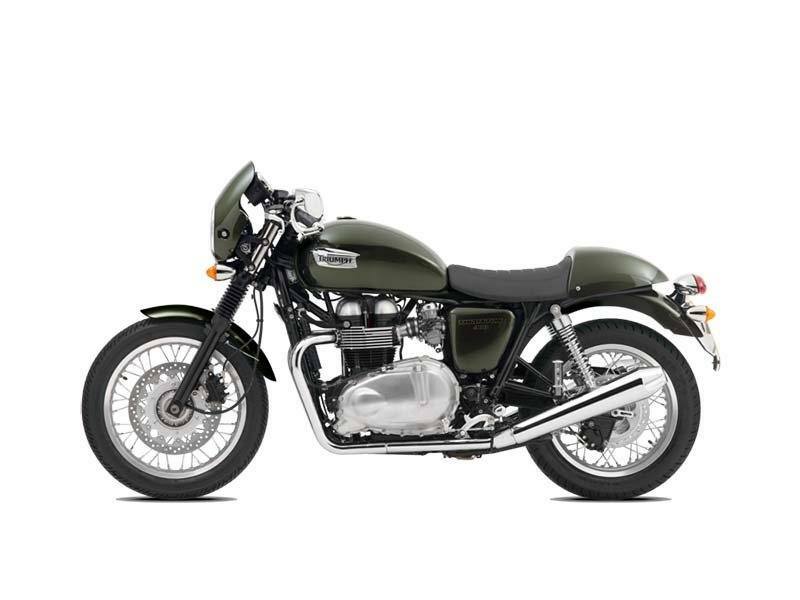 And just like those café racers of the 60's, the modern Thruxton is Bonneville based but nowadays, our engineers have made sure it rides like a modern Triumph twin. 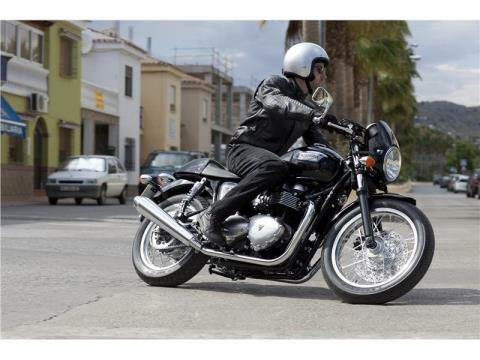 So it’s dependable enough for everyday use, easy and fun to ride yet still evokes the classic café racer look. Brakes: We fitted the front with a big 320 mm single disc strong enough to match the sporting pedigree of the Thruxton with plenty of feedback to enhance your ride. Yet we've made it as unobtrusive as possible within the 1960’s styling. 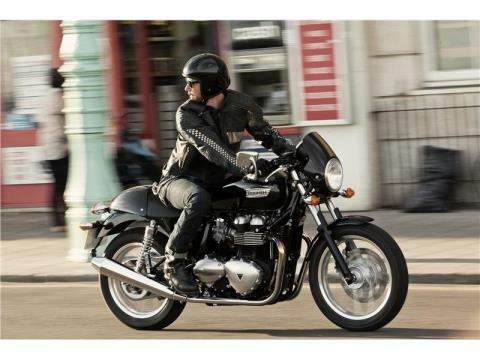 At the rear is another disc, so there’s no compromise in the Thruxton's thoroughly modern braking performance. Handling:	We kept the geometry similar to the Bonneville's but with a little less trail at 97 mm so you get sharper steering and more urgent handling when ridden hard. 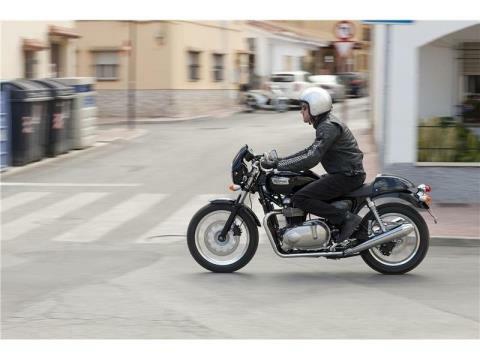 But the same neutral, obedient feel during less exuberant riding, making the Thruxton a rewarding as well as an easy bike to ride. Riding Position: Pure 1960’s café racer but not at the expense of comfort, that's what the Thruxton is all about. So there's a sporty forward lean that makes you look the part. The footrests have been raised and set back to complement the bar position, so you are close to the bike and can really feel how the front end is performing. We’ve positioned the bar end mirrors to work best when you are tucked down and forward, providing a good view of the road behind around elbows and body. But none of this is so extreme that it spoils the feeling of versatility. 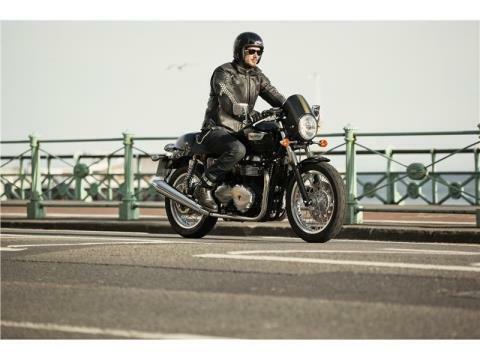 You can still tour or commute on the Thruxton as well as take it for a sunny Sunday burn. Performance: The café racers were built to perform, not just to look good. Today, this 865 cc parallel-twin puts out a healthy 69 PS with 69 Nm of torque at its peak, with plenty available at low revs so you get most use out of it. Fueling is controlled by a sophisticated computer programmed management system for clean emissions and a smooth, predictable throttle response. Bodywork: We created a style for the Thruxton that echoes the 1960’s café racers. Back then, machines were modified by their owners for higher speeds and sharper handling. We used classic 1960’s paint schemes with period sports stripes and fitted a typical single-seat, or so it looks thanks to the rear cover. 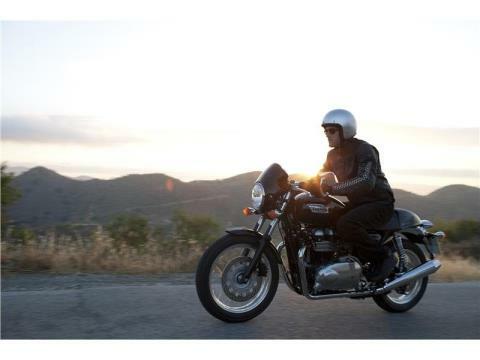 In actual fact, a passenger can enjoy the ride on a Thruxton too. 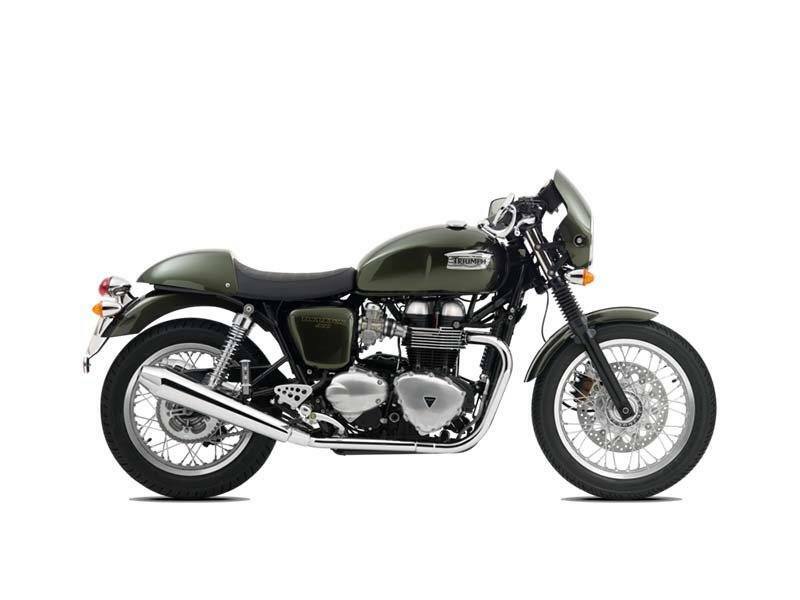 Engine: You get the same iconic, air-cooled parallel-twin that sits proudly at the heart of the Bonneville. Setting the 60’s style for the entire bike. The engine and transmission has been engineered with the look of the classic Triumph twins in mind. Even the fuel injection has been molded so you get the appearance of a pair of carburetors. And there are double overhead camshafts despite what looks like a pushrod tube at the front of the engine, just like the café racers of the 60's used to have.